Made by Colson Company in Elyria, Ohio, United States of America, 1925-1935. 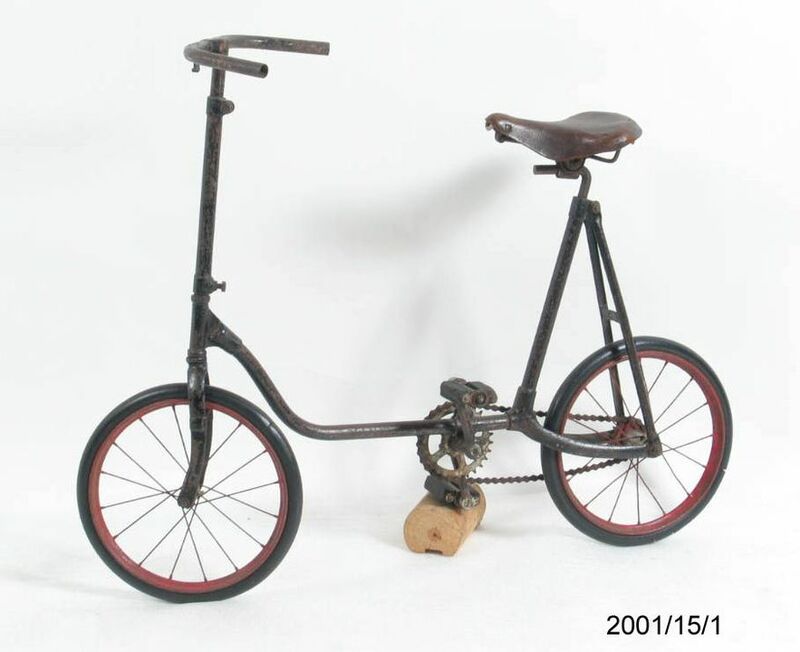 The Fairy brand bicycle is a very unusual and relatively rare example of the application of the design of safety bicycle, which was developed in the 1880s for adults, for children aged between five and ten years. It is being acquired with a baby’s plate that features an illustration of a similar bicycle, referred to in a verse on the plate. Bicycle, child's, 'Fairy' brand, metal / rubber, Colson Company, Elyria, Ohio, USA, 1920-1935. A child's two-wheeled bicycle with a simple tubular steel frame, triangulated between the rear forks and the saddle post. The brown leather saddle is adjustable for height as well as forward and aft rake. The adjustable handle bars are of tubular steel and show remnants of nickel plating. The pedals are rubber on steel cranks and show remnants of plating. The sprocket is five-spoked and also shows remnants of plating. The rear sprocket has the word "Fairy" impressed into the right hand flange. The chain is of the simple type link. The wheels have sixteen tangential spokes and are fitted with solid rubber tyres. The bicycle frame has the remains of black paint all over while the wheels and spokes are red. The handgrips are missing. Impressed on the rear sprocket 'FAIRY'. During the 1870s and 1880s attempts were made to make the high-wheeler bicycles (penny farthings) safer to ride. The first bicycle to be called a Safety cycle was patented by H. J. Lawson in 1876. More Safety cycles began to appear in the mid 1880s and in January 1885, J. K. Starley introduced the first Rover Safety cycle. Other versions were made and in 1888 Starley produced a model with a chain drive to the rear wheel and with wheels of a similar size, which meant that the rider could reach the ground. It also featured direct steering to the front wheel and a diamond-shaped frame. This design was subsequently used by many other safety cycle makers. The safety bicycle was a huge success. Recreational and sporting clubs flourished with the development of a safe, economical personal mode of transport. However, as the 19th century closed, the bicycle industry began a rapid decline. Between 1900 and 1905 the number of bicycle manufacturers in the United States shrank from 312 to 101. Interest in the automobile was partly responsible, as was a change to other recreational activities. Furthermore, a number of electric railways took over the sidepaths originally constructed for bicycle use. Thereafter in America, for over half a century, the bicycle was used largely by children. Bicycle manufacturers targeted the full-size two wheel bicycle to teenagers while younger children were provided with tricycles and scooters. However, during the 1920s and early 1930s, in a bid to attract younger riders, small two wheel bicycles were developed for children aged five to ten years. They were advertised as 'sidewalk' bicycles and, with their small wheels and low construction, were relatively safe. The 'Famous Genuine Fairy Ball Bearing Speed Bikes' were advertised in the Spring & Summer 1931 catalogue of Sears, Roebuck and Co, Philadelphia, USA. Two models were available, the Fairy De Luxe with New Departure coaster brake, enamelled in 'Willow green' with red striping at a cost of US $15.47; and the Fairy Speed Bike without coaster brake finished in enamelled red with black striping for $11.48. It remains unclear how popular these small two-wheelers were though their cost would have been prohibitive as large rubber-tyred tricycles varied in cost from $2.69 to $4.39 and scooters $3.85. This bicycle was made by the Colson Company of Elyria. Ohio, USA. This firm was began in 1885 by Winslow L. Fay as the Fay Manufacturing Company. Their first products included a dirt scraper used to smooth the roads for cycling as well an adult tricycle marketed under the 'Fairy' name. A hand-powered version was also produced. Fay sold the company to Arthur Garford in 1891 who hired a salesman by the name of Fred Colson. Colson became the vice president under George Worthington who had changed the name of the company to the Worthing Manufacturing Company. In 1917 Colson persuaded stockholders to merge the Worthing Company and another division of the Fay company to form the Colson Company. As president, Colson created a line of children's bicycles, scooters and tricycles which were sold to hardware and department stores such as Sears, Roebuck and Company under the 'Fairy' name. After the depression, features were added to the bicycles to differentiate them from their competitors such as a two speed enclosed crank housing and a frame-mounted lever for gear changing. The Colson Company last made bicycles in 1953 when the bicycle division was sold to Evans. Today the Colson Caster Corporation is a member of the Chicago-based Marmon Group of Companies. This bicycle was made between 1925 and 1935. The vendor acquired the bicycle in about 1996 secondhand. It is believed to have had one original owner who lived in Sydney Road, Manly, where a dairy had been.